This post was written in exchange for a t-shirt from Willow Co Design; however, all opinions are my own. This little man of our loves to eat. I should have known he would be a good eater from day one as he guzzled breastmilk like he just ran a marathon. As he reached the 6 month mark, we slowly but surely began introducing him to solid foods. I wanted to ensure that his palette became accustomed a variety of tastes, so we introduced everything from avocado to liver to peppers along with a variety of spices for flavor. Around the first birthday mark, as he began relying less on breastmilk as a main source of nutrients, we began introducing daily snacks into his diet along with his meals. That being said, we eat a primarily paleo diet in our home (with a few exceptions). And by we, I mean Asher too! He has been gluten free since day one, and aside from a week where I did some experimenting with introducing dairy to him (which left him quite constipated), he has been dairy free since birth as well. Because I have suffered from several gut health issues throughout my own life, it is incredibly important to me as his mother to get that little body of his off on the right foot from the start. In addition to being gluten/dairy free, it is important to me that he is getting real, nourishing foods each time he eats. 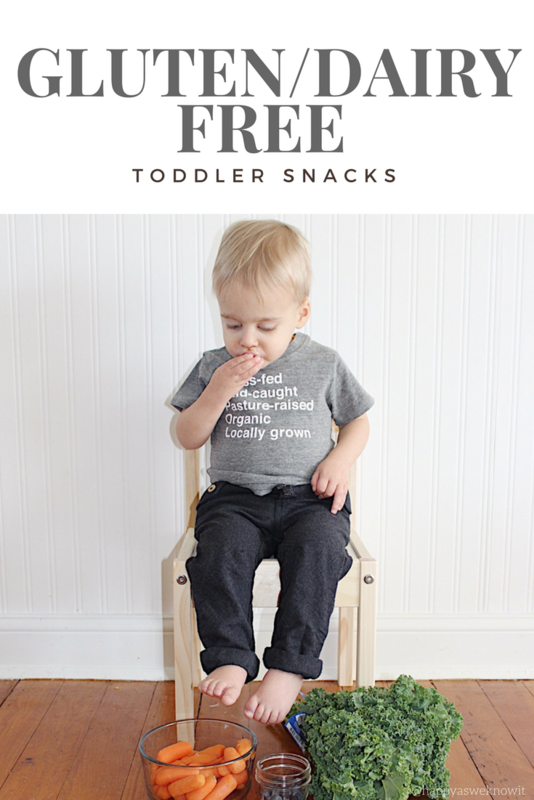 Which leads me to this post, dedicated to our favorite gluten/dairy free toddler snacks. Having a now toddler, I have come to find that meals are tend to be easier, as I plan for them each week, and we all eat the same thing. But sometimes snacks can be trickier when you are trying to ensure that your child is receiving something healthy, but at the same time quick and easy (which is incredibly important as your toddler is hanging on your leg begging for food). The following are some of my favorite go to's for this specific occasion that can all either a) be easily grabbed or b) can be prepared in advance to be easily grabbed when that time of day arises. 2) Fruit - Kind of an obvious one, right? Just a tip for making it more likely the you actually use it as a snack - buy easy to grab fruits, like blueberries, or take a few moments after your grocery run to cut up your fruit in advance. 3) Avocado - This was Asher's first food, and honestly, he still can't get enough. Cut it up into little sticks, and let them go to town. 4) Applegate Turkey Rollups - You can do them plain, or add some avocado or a pickle inside. 5) Lara Bars/RX Bars - My child lives for these things. When we get them at the store he insists on holding the box until we arrive at the checkout (at which point he usually still doesn't want to give it up). Both of these can be pretty chewy, so I started by just cutting them into smaller pieces for him, and still do even now at 19 months. 6) Pickles & Olives - Because even as an adult I could snack on these all day. 7) Kale Chips - Try as I might, Asher isn't super fond of the texture of these yet. But he enjoys helping me bake them - and little does he know I like to hide them unsuspectingly in some of his other food sources. You can find my favorite recipe for crispy kale chips here. 9) Plantain Chips - I just started introducing these to Asher now that he has a few more teeth, and he is digging them so far. Our favorite ready made chips are from Trader Joes, but you could certainly make your own as well. 10) Hardboiled Eggs - Full of vitamins, folks. Add a little Himalayan pink salt - perfection. 11) Smoothies - As a mom, I have to admit this may be one of my favorite snacks as I can throw in a whole lot of goodness in one tasty treat. Plus, they are perfect for those weeks where new teeth are popping through. 12) Natural Popsicals - Speaking of new teeth popping through, I also love having popsicles on hand for such occasions or for those hot summer days. When Asher was smaller, I used to freeze breastmilk in ice cube trays and put them into mesh feeders for teething. Now, I freeze everything from apple sauce to coconut water to smoothies in our trays, and they make for a perfect afternoon frozen treat. 13) Raisins - We don't do these too much, but they are a classic and one of the easiest things to grab on the fly. 14) Almond Butter Tortillas - Asher loves "sandwiches", as he calls them. Poor kid may grow up thinking a sandwich is made with a tortilla, but for now, we roll with it. We love Siete's Grain Free Tortillas which are made from either almond or coconut flour. I just fold it in half and then rip it in two, slap a little almond (or PB) inside, and you've got yourself a grain free sandwich. If your child enjoys almond butter, it is great paired with apples as well. 15) Paleo Muffins - These are great when you've got some bananas on hand that need to be used, and make for a delicious morning snack. My favorite banana nut muffin recipe can be found here. What are some of your toddler's favorite snacks? Feel free to share some of your ideas in the comments as I am always looking for ways to keep it interesting. PS. Did you catch a glimpse of Asher's darling little shirt. 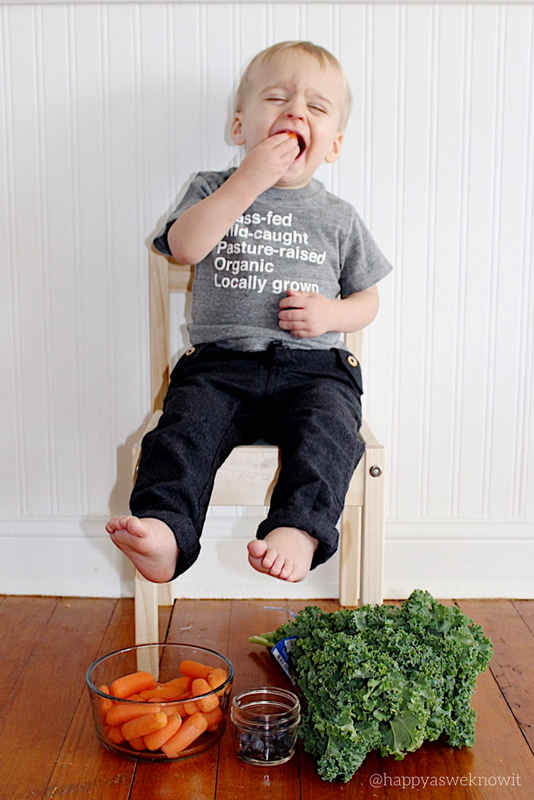 It's from an awesome little organic baby and toddler apparel shop called Willow Co Design. I absolutely adore the unique designs and messages that Crystal, the shop owner, puts out there. Check her out, and use code FREESHIP to get free shipping on a tee for your favorite toddler.